The question is CME, or not CME? Jack Torr of iS Academy highlights the importance of CME programmes and the benefits of implementing them in early phases of drug development. In fact CME in Europe was in place some three hundred years before Shakespeare amended this line for Hamlet in about 1600! However it is a question that so many European companies ask themselves when defining communication strategy, or indeed is it? Do companies seriously consider CME as part of their Market Access or Communication strategy? In Europe, apart from a few exceptions I suspect not. In some ways this is understandable, no control of content, perceived problems with accreditation with no promotion or commercial bias allowed. Especially when no sensible ROI calculation is available, and in Europe the cost of CME often has to be found from within the marketing budget. At this stage I am going to declare, as any good CME contributor should, an interest in CME, not only from a commercial standpoint but also unashamedly from a belief that CME used correctly is a strategic imperative. However, unlike some CME ‘purists’ I am a ‘realist’ and accept that CME from a company perspective must directly or indirectly support commercial objectives, but never losing sight of the ultimate objective of improving patient outcomes. So why should industry support CME? In October last year, the European Commission published a new policy on Corporate Social Responsibility, CSR, recent research has shown that the pharmaceutical industry does not score highly on CSR. No doubt there is a lot of activity in Corporate Affairs offices but an appropriate sustained CME programme across all relevant stakeholders can provide significant additional positive evidence to support CSR. Also, CME supports mission statements, underpins corporate values and shows commitment to a given therapy area. Good educational programmes enhance a company’s reputation with stakeholders. A US company with a strong franchise in oncology and accompanying education strategy undertook some online post programme research asking participants questions on the quality of the programme and who would the sponsor most likely be, at this stage the programme was ‘anonymous’, 71% (n=100) of respondents correctly identified one company as the likely sponsor, the other 7 potential sponsors gained between 2-11% respectively. Physicians are not the only stakeholders, forward thinking companies are developing and delivering programmes to all stakeholders including, payers, carers and patients. Doctor’s value accredited over non-accredited education. Although the quality of company driven education is often excellent, physicians always have the nagging doubt that it is biased. 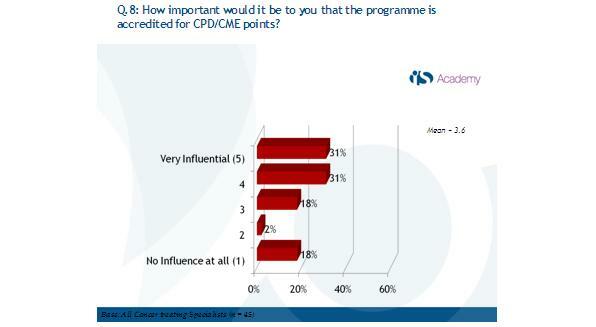 In an online questionnaire undertaken with oncologists, defining potential knowledge gaps, it’s interesting to see responses to the questions ‘how important would it be to you that the programme is accredited for CPD / CME points?’ (Figure 1). Figure 1: how important would it be to you that the programme is accredited for CPD / CME points? This demonstrated how this group believed accreditation of a programme positively influenced their choice. A similar question confirmed that physicians in this group also placed value on the accrediting authority. CME can improve adherence to guidelines and increase disease recognition and diagnosis rates. We know adherence and implementation of guidelines is inconsistent, we also know that there are very few, if any, conditions where patients would not benefit from earlier diagnosis and treatment, and companies also benefit. Industry spends significant promotional monies expanding knowledge in these areas, doesn’t it make sense for industry to support concerted independent accredited education with greater potential for implementation? CME is key in the pre-launch phase of any product, especially if it has a novel mode of action or fits into a multi-therapy or complex treatment regimen. Utilising CME, physicians and other stakeholders can be educated on the unmet medical needs in the relevant therapy area, strengths and weaknesses of currently available therapies, new therapies currently undergoing trials, how they compare with existing etc, the list goes on. But so many marketers believe they can do all this by a publication plan and a few advisory boards. Not only that, they have to wait until the commercial green light has been given to implement any meaningful promotional education plan, at that stage everything becomes branded with all the accompanying cynicism from the profession. I am always surprised why so many companies do not implement CME programmes early, having spent from around $3 billion upwards to get to early Phase III, investing a little more to provide a more knowledgeable and receptive audience for ultimate promotional activity seems eminently sensible. Companies spend significant sums of money on market research gleaning views, opinions and habits of physicians. One little utilised benefit of online CME is the ability to look at the ‘real-life’ metrics from analysis of the programme. I use the term ‘real life’ because the answers are obtained in a clinical setting, with real questions around real case studies / histories. I am not saying CME can replace good research but it can provide basic data that could ensure a research budget is more cost effectively utilised. CME is not a panacea for all education, physicians in Europe are not hovering to jump on any new CME programme that is available, points can be gained fairly easily. However, in a climate of greater market constraint, budget limitation and the explosion of digital communications, companies not currently undertaking CME have an urgent obligation to investigate the best way to integrate CME, as it will be even more necessary in future. When not flying around Europe preaching the merits of Continuing Medical Education or developing education programmes, Jack spends his time with his wife Julie, dogs and cat in his rambling old house in the Somerset Blackdown Hills. Jack has had a long, in fact very long career in healthcare and healthcare communications with roles ranging from medical salesman to Chairman of groups of companies including healthcare advertising, PR, promotion and medical education agencies, both in the US and Europe. He started to specialise in CME some 7 years ago and is an enthusiastic supporter of the Good CME Practice Group. Jack Torr is Director of iS Academy an independent provider of CME both in Europe and the US. Do companies seriously consider CME as part of their market access or communication strategy?